I was among thousands of museum goers who attended the Frida Kahlo exhibit at the Philadelphia Museum of Art. It is an understatement to say that the works were compelling and heart wrenching. Having a bit of anthropological DNA in my blood, I always tend to not only appreciate the main exhibit but the experiential exhibition of the observers. It is quite intriguing to watch how people respond to not only the main feature in a physical space but also how they interact with one another, but mostly strangers as we journey through different historical and cultural planes. There were obviously many reactions to Frida Kahlo’s life and works. My co-observers focused on different levels and features of the artist and her works. Some were solely concentrated on the aesthetic and technical aspects of her paintings. Others were immensely intrigued by her culture and social dynamics which influenced her creativity. Oddly enough, I didn’t overhear anyone comment on her disability. Her life and brilliance of her works may very well have overshadowed that particular element of her character and life. I would say that the experience was memorable for me, but rather typical as far as museum expeditions go. It was not until I exited the museum that the real unveiling of life began. Wanting to go into the city, I began to board a tourist bus. With relative naivety, I said to the driver, “Will you please deploy the wheelchair lift?” I should have known when he looked a bit confused and annoyed that drama was right behind. It took 45 minutes for this untrained driver to learn from a tourist from California how to operate the wheelchair accessible equipment. The driver, besides being frustrated and embarrassed, was being harassed by a string of drivers who were behind the tourist bus. They honked and yelled as if that would expedite the process. Many people including the museum staff were visibly upset at this interruption in their schedule. They were people with places to go and people to see and this one stranger in their midst was holding up progress. Part of me felt bad for the inconvenience but a larger part of me wondered how much the tourists who saw the exhibit were sensitized by their understanding of Kahlo’s life. 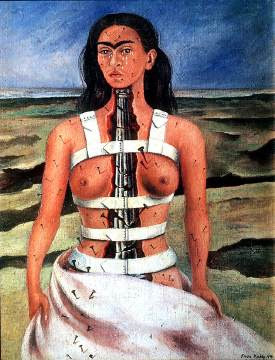 Did they have a glimpse into the disability experience and how that may have impacted Kahlo’s emotional creativity? A whole generation of people who started disabled student services and campus wheelchair sports teams is passing away. I caught this obituary from over the weekend. Jim Hayes was born in Fort Worth, Texas, in 1949. He injured his spinal cord in a diving accident on his 18th birthday. Hayes went on to be student body president at his junior college, then president of the Handicapped Student Association at the University of Texas-Arlington. After his graduated in 1974, he took a job on the Arlington campus, launching the Office for Students with Disabilities. Later, he was the ADA compliance coordinator on campus. Jim Hayes also had a lifelong passion for sports. He started wheelchair basketball and wheelchair tennis programs at UTA. In 2000 he became full-time coach of the Moving Mavs --who won seven National Wheelchair Basketball titles under Hayes' direction. Hayes was a wheelchair road racer himself; he won a gold medal at the 1984 Paralympics, and he volunteered at the National Veterans Wheelchair Games. In 2004, one of his former students, Randy Snow, became the first wheelchair athlete inducted into the Olympic Hall of Fame. UTA students or alumni have represented their home nations in every Paralympics Summer Games since 1984. As a result of Jim Hayes' work, the UTA sports program was one of the first in the US to give full athletic scholarships to physically-disabled students. Hayes died Friday, at the age of 58. But what I remember most was that she humiliated a little boy, made him stand in the middle of the room and take her berating in front of all of us, for the crime of.... leaving the toilet seat up. Did any of us object? We wouldn't have dared. Did any of us reach out to him afterwards? I don't remember. Do any of those sweet little boys in that photo above look like they deserved that? They didn't. They couldn't. 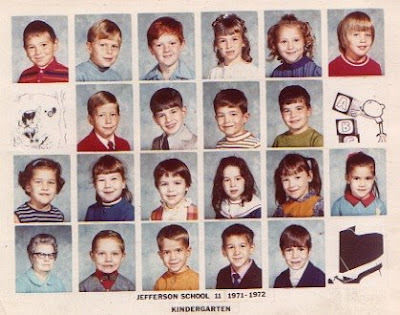 A lot of us, including that little boy and me, we graduated high school together--and I'm sure none of us forgot that moment. Alex, your classmates, the ones who were led to vote against you, will be haunted by this moment. They were asked to be cruel to you, by an adult they trusted. Two of them voted in support of you, by all accounts, and they're obviously great kids, but the others aren't bad kids, just five years old. The adult in this case should be removed from the classroom and disciplined and, if possible, trained out of whatever ideas got her to this place; but the kids are just kids who were put in a terrible situation. And Alex, you're just a kid too--and you absolutely didn't deserve this. But hang in there-- with any luck, you will also meet amazing teachers and peers, and learn, and flourish. A whole lot of us are watching now, and we expect the best for you. Homofactus Press has us on their blog book tour schedule (and apparently CripChick and Wheelchair Dancer are also stops on the tour). The book they've sent us information about this time is Cripple Poetics by Petra Kuppers and Neil Marcus (photos by Lisa Steichmann), which they describe as "by turns playful, unsettling, raw, and moving...an immersive and sensual correspondence that builds and heats by accretion--one keystroke at a time." 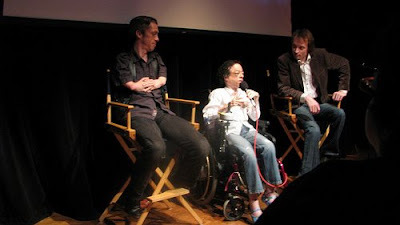 Kuppers and Marcus are each, individually, respected performance artists in the field of disability studies. If that sounds like your bag, check it out when it's released this summer--or check out some excerpts here. New to the idea of "crip poetry"? Check out Jim Ferris's "Crip Poetry, or How I Learned to Love the Limp" essay, here. Petra Kuppers was my roommate at the first Society for Disability Studies conference I ever attended, in 1999, which was also where I first met Mike Dorn. (Petra laughed because I bundle up to sleep, socks and all. You might guess from her work that she's not so much for the bundling.) Whenever you think, wow, it would be so cool if someone could combine this topic and that topic and do something provocative with all the intersections and overlaps and contradictions--well, Petra's one of the people who can do such things, and does them beautifully. Kathryn at Ryn Tales has done a lovely job of gathering a wide variety of posts around the theme "spirituality and disability." Check it out, for heartfelt explanations, pointed critiques, joyful celebrations, and humor, too--because what's better for the spirit than some well-timed laughter? This edition's theme was chosen before the story of Adam Race hit the news, but several of the contributes comment on that current situation, too. Next edition will be hosted by Emma at Writings of a Wheelchair Princess, on June 12 (three weeks away). She's set the theme "If I knew then..." which seems like a very open invitation indeed, so write something and submit it for consideration: you can use the blogcarnival.com form, or leave your link in a comment here, or at Emma's blog, or you can just use the phrase "Disability Blog Carnival" in your post, and I'll probably find it that way, too. "a person utilizing investigative ability well in excess of that available to the mother and housewife she claims to be..."
Sometime recently, like over the weekend, my Bloglines feeds passed the 400 mark. Now, some of those are defunct feeds that I just keep for the saved posts in them; some are personal friends' blogs, or local blogs, or stuff about history, feminism, maps, music, books, etc. Some are search feeds. But honestly, most of them are disability-related blogs, active and posting a lot! So I guess the 400 mark is as good a time as any to update our blogroll here--it's been a while since I did it--watch for some exciting additions in the next few days. ADDED LATER: Wow, there are a lot to add. This is going to take a few days. I'm marking new additions to the blogroll "(new)," but truly most of them I've been reading for quite a while--kinda surprised to discover some of them weren't listed here yet! This year the legendary disability rights direct action group ADAPT celebrated its 30th anniversary with a week of protest and advocacy in the nation's capital. Day Two of the action, April 29, 2008 saw protestors camped outside the offices of United States Senator John McCain in the hopes of securing his support for the Community Choice Act. In the end, Senator McCain refused to meet with the protestors and arranged for over 30 to be arrested. DSC05445, originally uploaded by Philly Bike Coalition. Given the high gas prices, there has been a lot of discussion lately in Philadelphia about creating new incentives for everyone to bike to work. So when Mayor Nutter takes to the road for Bike to Work Day, he of course travels with security, wearing a florescent shell and a smile. But when Mike Dorn bikes to work at Temple University after dropping off books at the Van Pelt Library on the University of Pennsylvania campus, he has to cross the Girard Avenue bridge across the Schuylkill River. The trolley tracks that run down the center of Girard Avenue make it particularly difficult to transition safely to the left lane before turning left towards North Thirty-Third Street. With the trolleys running once again on Girard Avenue, the tracks are now smoother. Riding across the bridge at 8:45 am of April 20, 2008, while transitioning to the left land my bike tire caught the trolley groove and threw me face forward. I caught myself with my outstretched right and left hands but still bounced my chin on the pavement. I was wearing gloves due to the coolness of the morning, but unfortunately no chin padding. Today I am still on the mend, after having eight stitches removed from my chin, but still wearing the flexible cast on my right hand. I don't know what can be done about the trolley tracks around the city but they sure are a hazard for cyclists! I, for one, am not planning on biking from Penn to Temple again anytime soon. I wish you all the best with your own adventures in urban mobility. By safe and have fun! Readers: thanks to Heather and Liam, we just received followup photos from the "Disability and the Holocaust" event that took place May 11, 2008 in Nottinghamshire, England. Enjoy! There is no way in the world I could ever take revenge on the disease that has disabled me. It just seems to me that disease, because it flirts with death, is a rather important subject to write about. American writer Stanley Elkin was born on this date in 1930, in New York City. 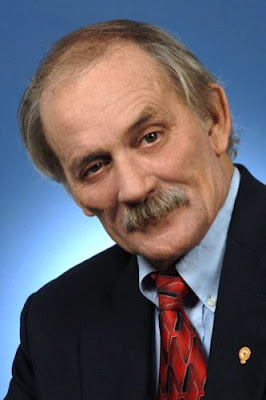 Elkin was a professor of English at Washington University in St. Louis. In 1972, he was diagnosed with multiple sclerosis (MS); from the mid-1970s, he used a wheelchair or a walker. Elkin's experience as a disabled person was reflected in his critically-acclaimed fiction, which had long tended towards dark comic observations, inventive language, and complicated plots centered on deeply flawed characters. Ben Flesh, the main character in The Franchiser (1976), has MS too; in Magic Kingdom (1985), the plot follows a group of terminally ill children who are treated to a Disney World vacation by a wish-granting charity. The children resent being made into pitiful spectacles by the charity's publicity, and wish only to be left alone together to share as peers. The novella "Her Sense of Timing" (1993) is about Professor Schiff, a political geographer with MS, who uses a wheelchair, and must prepare and host a party without the expected help of his wife. In 1993, Harper's Magazine published "Out of One's Tree: My Bout with Temporary Insanity," in which Elkin describes a two-week, prednisone-induced psychosis he experienced from prescription medication for his MS.
Stanley Elkin died in 1995, from complications following heart surgery. His papers are at Washington University in St. Louis. Next edition of the carnival will be hosted at Ryn Tales, with the theme "spirituality and disability." Links are being accepted for consideration now through Monday May 19, for a Thursday May 22 posting, so leave them in comments here or there, or at the blogcarnival.com form, or just put "disability blog carnival" in the text of your post, I usually find those too. May 8 was the birthday of Douglas A. Martin, a leader of the disability rights movement in Los Angeles in the early 1970s, active in Californians for Strong Access, and co-founder and director of the Westside Center for Independent Living in 1975. In 1971, he was the first grad student with a "significant disability" to win a UCLA Chancellor's Fellowship--and the next year he was UCLA's first disabled teaching assistant. He earned a PhD in urban studies at UCLA. Martin co-founded the Chancellor's Advisory Committee on Disability in 1983, and was a Special Assistant to the Chancellor to coordinate ADA and 504 compliance on campus. On the national level, he lobbied tirelessly to remove work penalties from Social Security provisions. Martin died way too soon, in 2003, at age 55. I don't watch TV if I can help it when I'm in the hospital. When my kid is hospitalized, it's usually in a shared room, and there's little choice. I remember being in a quad isolation room with him during the 1998 Clinton impeachment hearings; the mother across the room was shouting at the commentators a lot. Think I also saw an Olympics opening festivities in a PICU once? I know another mother whose son was born in July 1969--so she and the other women giving birth that week were among the Americans who did not see the Neil Armstrong moon landing live. What have you seen--or not seen--on TV during hospital stays? 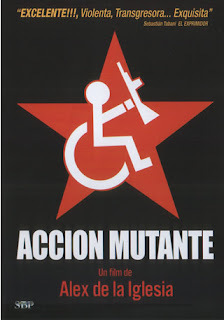 I've added a new post (both in -bad- English and in fine Spanish) to Caperucita Coja's Blog about Accion Mutante. "Toward a Politics of Disability: Definitions, Disciplines, and Policies"
ADDED LATER: Beth Haller has this remembrance. 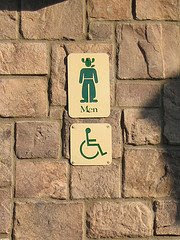 Disabled guy doesn't get a hat, neckerchief, chaps or boots, either.... spotted at Knott's Berry Farm last fall. 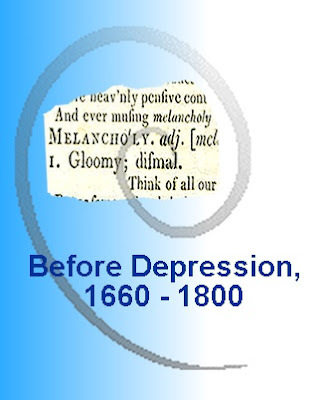 This conference program titled "Before Depression: The Representation and Culture of Depression in Britain and Europe, 1660-1800," caught my attention today--the conference itself is just part of a three-year project that also includes an ongoing lecture series, planned publications and an exhibit this summer of visual representations of depression in the 18th century. Too bad for me it's all happening at the University of Northumbria and the University of Sutherland--but good for any of you who happen to be in that neighborhood. If you attend any component of this project, I'd love to hear more about it. From time to time we will offer this space to organizations working in partnership with the disability community to address issues of widespread interest. The Wireless RERC in Atlanta has developed a new web portal that shows great potential. We wish them well in fostering cross-disability conversations (in English at first, but one hopes in additional languages as the utility of the portal is demonstrated), as we all grapple with a democratizing communication platform -- the cell phone. See Horst and Miller (2006) for an anthropological view of how this emergent technology is incorporated into particular communication cultures. Reference: Heather A. Horst and Daniel Miller (2006) The Cell Phone: An anthropology of communication (Oxford and New York: Berg). Congratulations on a great website/blog. It is clear that you have put in a lot of skill, effort and commitment into developing such extensive, useful and compelling content. I just wanted to introduce the readers at Disability Studies to our organization, the Wireless RERC, based in Atlanta. We are a research and engineering group funded by the National Institute on Disability and Rehabilitation Research (NIDRR) of the U.S. Department of Education. NIDRR funds a number of other RERCs dedicated to research and engineering for people with disabilities [list]. Our group includes faculty and staff from the Georgia Institute of Technology and the Shepherd Center, a critical care facility dedicated to spinal cord injury. 1. Conducting research on the wireless needs of people with all types of disability. Additionally, we have just launched MyWirelessReview.com with the hope of creating a space where people of all abilities can share opinions, information, tips, news items about wireless technology as it relates to people with disabilities. As we have just launched the site, we are eager to invite participation from the readership of DS, TU. While we ramp up, I have been posting some news items that have implications for wireless users with disabilities, and some comments from participants in some of our recent focus groups. I have another audio clip from a different technology instructor at CVI detailing her experiences downloading and installing Mobile Speak software onto her mobile phone. Great stuff! Very informative. I’m still waiting on final approval from the presenter. The Wireless RERC examines and analyzes accessibility policy issues related to the use of wireless communications and other information technologies. Key activities include regulatory filings, policy briefs and timely advisories to stakeholders on municipal wireless networks, emergency communications and related issues. The RERC has developed a “Collaborative Policy Network” to bring together experts in various aspects of the policy process in the telecommunications and information technology-related fields. This Network will provide support internally to the Wireless RERC and to other RERCs in telecommunications and information technology-related fields. The RERC is guided by the Georgia Institute of Technology and the Shepherd Center. The Georgia Tech team includes the Center for Advanced Communications Policy, the Interactive Media Technology Center, the Georgia Tech Research Institute, the College of Computing, and the School of Psychology. Check us out at: http://www.wirelessrerc.org. "Sometimes I have good days and take the stairs. Sometimes I have bad days and take the elevator. Sometimes I have good days and take the elevator to avoid the chance of my day turning into a bad day. All of these decisions are mine to make, and are no one else’s business."